When you are in need of flood damage restoration for your home or business, we are the experienced and dependable partner you can trust. 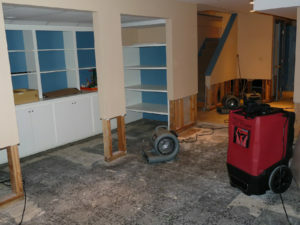 We are a licensed, insured, and certified flood damage restoration company. We treat your home or business with the same care as if it was our own. We will extract the flood waters with our pumps and generators. Materials in your home that are wet or damaged will be disposed of. These may include soaked carpeting, flooring, insulation, walls, damaged furniture, and any other affected materials and debris. In case you have an older property that may contain lead paint, asbestos, and other hazardous materials, we are licensed and equipped to deal with such hazards. We will take an initial moisture reading, and use our industrial strength air movers and dehumidifiers to dry out your flooded rooms. The moisture level of the rooms will be continuously tested to determine when they are completely dry. This drying process can take several days, and will ensure that mold does not have a chance to grow or continue growing. We also use and anti-microbial spray to remediate any mold growth. We will then use our expert craftsmanship to rebuild your walls, beams, and flooring to pre-existing quality. We will tape and compound all drywall, then prime and paint the walls and ceiling, resulting in a smooth professional finish. We will also reinstall any electrical outlets and covers. When we are done with the flood clean up and restoration, we will make sure all of your personal belongings and furniture goes right back where they belong. Call us at (877) 645-1428 for our flood cleanup and restoration services.